As far as weeknight meals go, this is a showstopper. You've got a flaky olive oil crust as the base, coupled with the deep flavors of roasted garlic and caramelized onions. The sweetness of the tomatoes is just the cherry (literally!) on top. 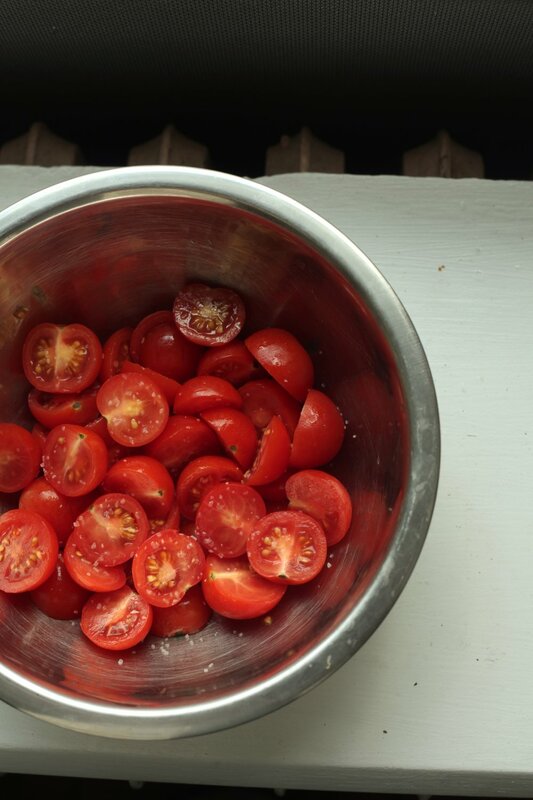 This recipe is the perfect way to use up those pantry items you always have laying around, as well as all those garden tomatoes in the summer. And personally, I love the novelty of having my own individual anything. 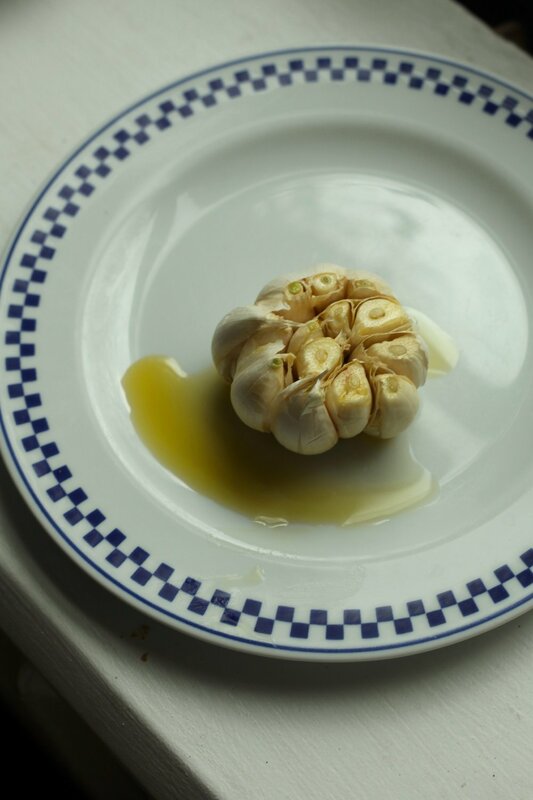 I recommend roasting several extra heads of garlic at a time - it's delicious on everything from salads to sandwiches, and keeps well in the fridge. I like to chop my basil by stacking several leaves on top of each other, rolling them up (stem side at the base), then chopping into 1/4 inch sections. I find that a bench scraper is the perfect tool for easily transferring the assembled galettes to your baking sheet. Have I mentioned that the bench scraper is my favorite kitchen tool? In a medium bowl, whisk together the flour, cornmeal, sugar, salt, and black pepper. Cut in the butter using your fingertips or a pastry blender until the largest pieces are the size of tiny pebbles. Pour in your olive oil and ice water, then use a rubber spatula to pull the dough together. Knead a couple of times with your hands, then divide the dough into four equal pieces. Flatten each piece into a disk and wrap them in plastic individually. Refrigerate for 45 minutes. Preheat the oven to 400 degrees and line a large baking sheet with parchment paper. Cut about 1/4-inch off the top of the head of garlic to expose the tops of the bulbs, leave the papery skin intact. Drizzle the exposed bulbs with 1 teaspoon of olive oil. Wrap tightly in aluminum foil. Bake on prepared baking sheet at 400 degrees for 40-45 minutes, until the cloves are softened & delicious smelling. Set baking sheet aside to use later. Once the garlic is cool enough to handle, pop the bulbs out of their casings. In a small bowl, use a fork to smash them into a smooth paste. Peel, halve, and thinly slice your onion. Heat two tablespoons of olive oil in a large non-stick pan over medium-low heat. Once hot, add the onions. Once onions have started to turn a golden color, lower the heat. Sprinkle a few pinches of kosher salt over the onions and stir to combine. Cook on low heat for 25-30 minutes, until deeply golden and shimmering. Remove from heat. While onions are caramelizing, halve the cherry tomatoes. Place them on a cutting board, then sprinkle evenly with a pinch of kosher salt (this will help bring out the juices). Chop your fresh basil into thin strips. On a lightly floured surface, roll each piece of dough out into a 6 inch circle. Note: because this dough is so flaky, it's prone to tearing. If this happens, don't worry! Just patch it back together/pop it in the fridge to firm up a bit. Transfer the circles to the baking sheet you used earlier to roast your garlic. Brush each circle with the roasted garlic paste, leaving a 1-inch border around the edges. Divide the caramelized onions evenly between the galettes. Add the feta cheese layer. Finish with the halved tomatoes, cut side up. Fold the edges of the crust up around the filling, pinching it together in several places to hold the filling in. 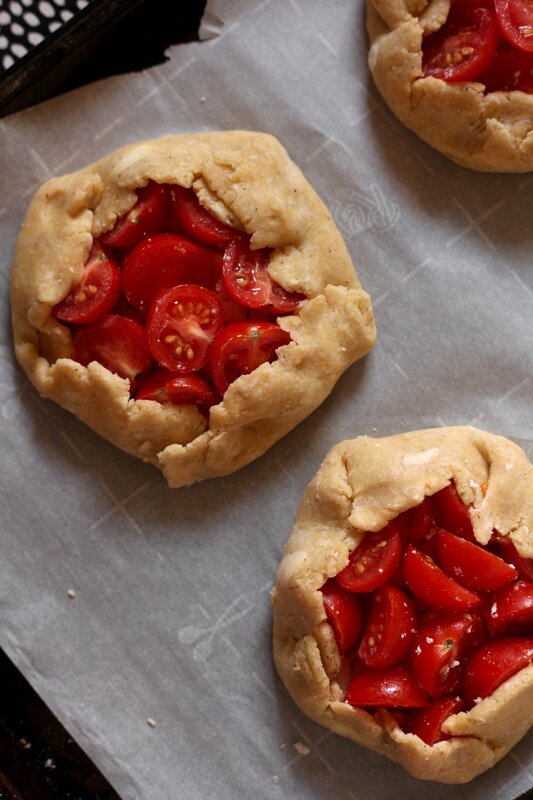 Bake at 400 degrees for 30-35 minutes, until tomatoes are starting to burst and crust is golden. Transfer to a wire rack and cool for 20 minutes. When cool, sprinkle with the basil leaves.